Halloween is a way of life for the Monster Rangers, as both Manlings and Monsters celebrate the holiday. 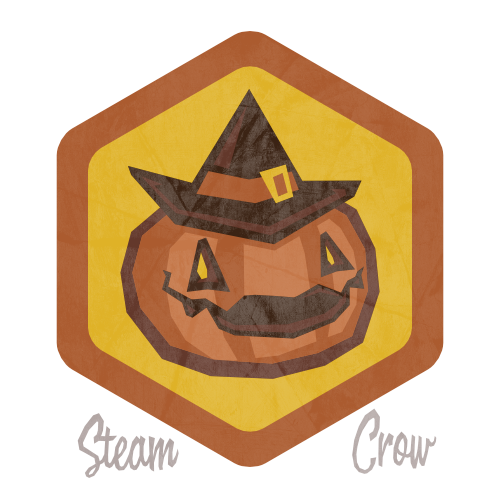 Jackoween is a Halloween party by and for monsters – hosted by Steam Crow. There is but 1 level of the Jackoween Badge. Daniel and Dawna hosted our own Halloween/Jackoween party for years; now we’re bringing them back. The Jackoween badge is worth 25 Glory points, double most Spirit Badges. But this one is special. Jackoween features a Halloween Golem, the “race” of Marrow Thatch. This is a rare badge, at least currently. Come to our Jackoween Party. Be nice to others. Have fun. Meet some Rangers and Monsters. Laugh.